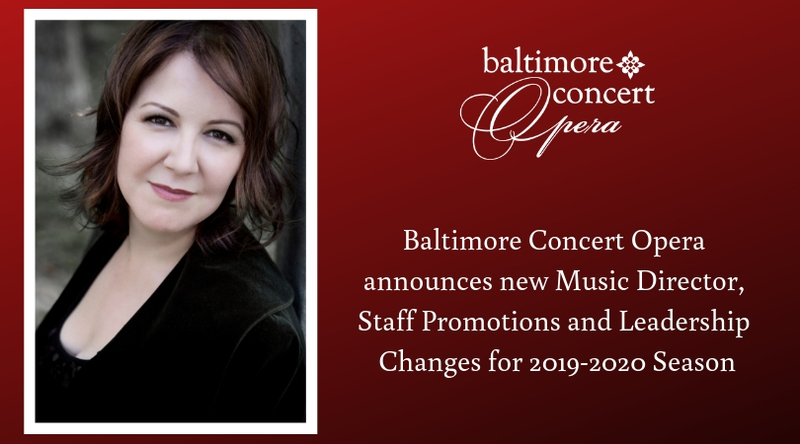 BALTIMORE, Maryland (February 18th, 2019) – As Baltimore Concert Opera (BCO) continues to flourish, the company announces the appointment of a new Music Director, a promotion, and a retirement. All changes will become official on September 1, 2019, though planning for the 2019-2020 season has already begun with the new staffing model in place. After ten years in leadership at BCO, Founding General Director Brendan Cooke will retire his current position of Artistic Director this September. Current Executive Director and co-founder Julia Cooke will be promoted to General and Artistic Director. About Baltimore Concert Opera: Founded in 2009, BCO presents concerts of complete operatic masterpieces with singers and piano in the intimate setting of a gilded 19t h century historic ballroom. This experience allows the audience to focus on the artistry of the music, and the beauty of the unamplified human voice. All performances are through the auspices of the Garrett-Jacobs Mansion Endowment Fund and its Artists in Residence program which is part of its community outreach mission. For more information about Baltimore Concert Opera, to make a tax-deductible donation, or to volunteer, please visit www.BaltimoreConcertOpera.com. BCO is a 501(c)(3) non-profit organization. We are deeply grateful for the continuing support of the William G. Baker, Jr. Memorial Fund (www.BakerArtist.org), creator of the Baker Artist Portfolio, the Maryland State Arts Council, The Citizens of Baltimore County, the Venable Foundation, the John J. Leidy Foundation, Bloomberg Philanthropies, the Louis L. Stott Foundation, and Mayor Catherine E. Pugh and the Baltimore Office of Promotion and The Arts. Baltimore, MD — September 18, 2018 — Baltimore Concert Opera today announced that it is a granteerecipient of Bloomberg Philanthropies’ Arts Innovation and Management (AIM) program. The invitation-only program seeks to strengthen the organizational capacity and programming of small and mid-size cultural organizations within Atlanta, Austin, Baltimore, Denver, New Orleans, Pittsburgh and Washington, D.C. Through the $43 million multi-year initiative, Bloomberg Philanthropies will provide unrestricted general operating support as well as arts management training in areas that include fundraising, strategic planning, marketing and board development. Since 2011, AIM has helped more than 500 small and mid-sized organizations in all creative disciplines, including theater, visual arts, music, film, literature and dance. Participating organizations reported significant improvements in board development, fundraising and overall income over the two-year program. Watch this video for an overview of the Arts Innovation and Management program:https://www.youtube.com/watch?v=4KJy8DgjRDg&feature=youtu.be. visit www.bloomberg.org or follow us on Facebook, Instagram, Snapchat, and Twitter. BCO announces the addition of two new positions to its staff! Entering its 10th Season, Baltimore Concert Opera continues to thrive, adding to its staff to expand its organizational capacity. Nicole Steinberg has joined the team as Operations Director while former Managing Director, Courtney Kalbacker, moves into the new position of Director of Community Engagement. Composer and conductor Michael Ching will lead a double bill of operatic comedies on April 13th and 15th to close BCO’s 9th season, Puccini’s Gianni Schicchi paired with Maestro Ching’s own sequel to Puccini’s masterwork, Buoso’s Ghost. Maestro Ching joined Executive Director, Julia Cooke for a fascinating interview about his extensive career in every job in the opera business, his ideas about composing and contemporary opera in general, and his connection to Baltimore. Read on to find out about the very interesting, very fun Maestro Michael Ching. A selection of quotes are below. To read our full interview, CLICK HERE. I got the opportunity to study opera composition with Carlisle Floyd, and the thing about Carlisle Floyd that your audience may know is that he writes his own librettos. And that was of interest to me, since for (my) college (opera) project I’d written my own libretto. That was really invaluable training for me to work with him. It was very difficult, challenging, soul-busting actually. He was very exacting and challenging, and I think that was good training. On his compositional process: Words first, or music? On the evolution of Buoso’s Ghost: have you made any changes to it over its 22 years? If you don’t have your tickets yet for Gianni Schicchi and Buoso's Ghost (4/13 at 7:30pm and 4/15 at 3pm), we do still have some available. Click HERE to find out more about the rest of the cast, and click HERE to buy tickets which start at just $27.50. Chrystal writes about how she became an opera singer, and about singing the role of Charlotte in Werther for the first time. I always sang, but never thought "I am going to be a singer one day!" I have always wanted to help others, but it wasn't until I started at The Governor's School for the Arts (GSA) in Virginia that I settled on how. I originally wanted to teach English/Language to grade school children because I felt, and still feel, that teachers have great influence on our world’s citizens. My next choice was a psychologist/middle school guidance counselor, for similar reasons. Then came biologist my sophomore year of high school - I figured I could help mankind by finding cures for unknown ailments! Mind you, I had still been singing all the while. GSA took a trip to New York City and I remember being glued to the floor listening to Leontyne Price sing on one of the monitors in Tower Records. I asked the head of the program how I could help people and still sing. He said I could help them THROUGH the music. This is what I've been trying to do ever since. I fell in love with Werther years ago. It all started with a man named Massenet. His music stole my heart and wouldn't let it go. He is, after all, the Puccini for mezzo-soprani. Ha! But, truthfully, his music itself has a soul. It is full of profound harmonies and intriguing rhythmic patterns that create intensely mesmerizing drama. It reaches me deep within and makes me want to pour out something I didn't realize I had. Music is a gift, and I believe we are called to share it. Massenet shared his gift in such a way, that I wasn't even aware I was receiving it. His music permeates the mind, body, and soul. It fills you with the lives of the characters, reminding you of your own experiences. No, not the same scenario, but you all the same. I sang the role of Charlotte in parts of Act III while in graduate school, and have been itching to complete the role ever since. Ahhhhh, excited doesn't even begin to express my state of being! Is probably the hardest type to prepare. Ha! The expectations are enormous, and those are just coming from myself! I've heard Charlotte in my head for years just as I believe the role 'should be.’ Preparing it is like trying to compete with a legendary recording. We are our own worst critics, and never has the saying been more true. But, the joy and elation of bringing this character I've only dreamed about for so many years to life is a good balance, as I have learned that those legendary recordings were made by artists committing to doing what they could on that day, and not dwelling on what they should be able to do or would be able to do later. The role of Charlotte is hard in its own right: stamina, endurance, tessitura, legato, heightened drama not hindering the throat, complex character, pure language, you name it. But when it comes to performance, great artists give what they have and don't apologize for what they don't. Mind you, they have A LOT already, but that virtue says something to me. They communicate. They share. They give. Besides, challenge brings about growth, and I love growing my art! I pray I do justice to Massenet's music. I pray I do justice to the gift that is music! Let's go, Team Werther BCO 2017!!! A special thanks to Chrystal for taking the time to write for us! If you don’t have your tickets yet for WERTHER (11/10 at 7:30pm and 11/12 at 3pm), we do still have some available. Click HERE to find out more about Chrystal and the rest of the cast, and click HERE to buy tickets which start at just $27.50. Originally posted 5/24/16. Updated 4/28/17. We’ve made a major effort over the past few years to collaborate in various ways with other artistic organizations. With children’s and student choruses in our productions (Children’s Chorus of Maryland, Maryland Boychoir, and Towson University opera students) we are able to educate and offer transformative musical experiences to young artists. By working with other local arts organizations (The Walters Museum, Chesapeake Shakespeare Company), we highlight the connection between opera and other art forms. However, the most expansive way we collaborate is by presenting co-productions with other companies, where the cast rehearses and gives concert performances at BCO, then travels to the partner company to prepare and perform a full production with staging, costumes, sets and orchestra. These artistic partnerships have been an instrumental part of BCO’s evolution, keeping us at the top of the opera game and in the news! Our co-productions with Opera Southwest (Albuquerque, NM) and OperaDelaware (Wilmington, DE) enable us to bring more variety to our programming, always offering our audiences top talent on stage. These collaborations also allows BCO to support the art form of opera at large, since the BCO component cements artists’ ability to get straight to the work of staging as soon as they arrive at the next company for the full production, enhancing their musical security when all the other elements are added. It is because of these collaborations that we are able to add very complex, or rarely performed operas to our repertoire, which our short rehearsal period wouldn’t allow time to prepare if they were solely BCO productions. It is our goal to continue to offer a combination of collaborations AND BCO solo productions in the coming years, fulfilling our mission to bring opera to Baltimore and beyond. Our Semiramide cast and chorus, who closed at BCO just a few weeks ago will open the fully staged production at OperaDelaware this weekend (performances 4/29 at 7:30pm and 5/7 at 2pm at The Grand in Wilmington). When I saw the principal cast after their final room run at OD, I told them how great they were and asked if having had that extra week at BCO had been helpful. They all gushed about how wonderful it had been, and what a luxury it was to be able to work together musically before moving to staging rehearsals at OD! 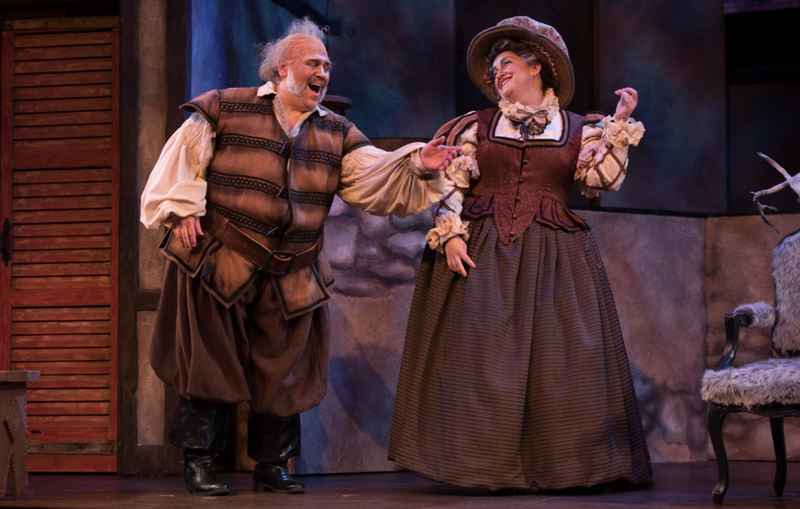 Last year, we had another successful collaboration with OperaDelaware: Verdi’s Falstaff. The top-notch cast arrived in Baltimore, spent five days rehearsing the “fiendishly complicated” score (Gail Obenreder, Delaware News Journal) and smoothing through the tough spots, getting to know one another and creating a tremendous team spirit, and enjoying Baltimore and everything it has to offer! After the last of the glowing concert performances in Baltimore, our casts travel to our partner company, and get straight to work on staging. The fruits of the collaborations are vast and shine brightly both at the BCO performances and at our partner companies - a win-win for all! Luckily, Baltimore continues to get the first taste of these partnerships. Stay tuned for more next season! Opera Delaware, Semiramide and Arsace. Photo: Joe del Tufo, Moonloop Photography. Baltimore Concert Opera, Falstaff and Dame Quickly. Britt Olson-Ecker Photography. Opera Delaware, Falstaff and Dame Quickly. Photo: Joe del Tufo, Moonloop Photography. Q & A: Bass-baritone Ben Wager speaks with BCO’s Executive Director, Julia Cooke about singing ‘Reverend Olin Blitch’ in our SUSANNAH this week. Ben Wager makes his Baltimore Concert Opera debut as the Reverend Olin Blitch in ‘Susannah’ this week. We are so happy he has time in his busy schedule this season to sing with us in between appearances with Lyric Opera Kansas City and Deutsche Oper Berlin. Recent years have brought Ben to Opera San Jose, Minnesota Opera, OperaDelaware and Den Norske Opera in Oslo. We are delighted to welcome Ben to BCO in this “dream role” of his. He was kind enough to share some thoughts about his career and journey as an opera singer, and in particular, singing the role of Olin Blitch with us. Q: What drew you to a career as an opera singer? A: I had been involved with music from an early age but it was not classical. I grew up playing guitar and bass guitar in rock bands but I never did much singing. When I was a senior in college, I went to local music store to find a singing teacher since I wanted to front my own band. After the first or second lesson I was persuaded to give classical music a try since I had an unusual voice part that was also pretty loud. I spent the next few years getting second opinions and steadily improving. I always wanted to be more in the spotlight but bassists didn't really belong there, singing bass made more sense for my personality than playing it! Q: Tell us about singing Blitch. I know you're very invested in this role, what makes it so interesting to you? A: It really is a dream role. It was written for my voice part (bass-baritone) which is essentially a bass voice whose strength lies in the upper part of his voice rather than the lower. Plus, it's always more interesting to play morally ambiguous or even evil characters than good ones. Blitch is just that: you don't know exactly where he lies on the moral continuum (he does feel remorse, after all) but it's not on the lighter side. It's also very interesting to explore how much a character like Blitch actually believes what he says he believes, versus what's simply showmanship. Samuel Ramey made the definitive recording of the role and his is a style of singing I've always admired and tried to emulate. Q: What is it like to sing a role for the first time? Particularly this one. A: A challenge! While Floyd knows how to write for the voice he writes some pretty difficult intervals and harmonic shifts. Often you have to sing very low notes in your range and then very high ones immediately after. In addition, Floyd will often have the singer sing a dissonant note that isn't supported by any other instrument in the harmony. As a native of Philadelphia, I'm also finding it challenging to deliver the text with a convincing Inland Southern dialect (it's written into the text so it must be done) while not compromising the musicality. Finally, I'm looking forward to playing a role that is histrionic within the context of the piece itself: rarely does a singer get to "perform" within a performance as I will get to do with Blitch during the revival scene. Q: Do you have any thoughts about the concert opera format, how it is helpful/challenging/anything else? A: It's probably my favorite way of performing anymore. I love the intimate setting, the gorgeous surroundings, and simply stripping the show down to its essentials. Everyone in the room can hear every note and see every expression on your face. It may sound daunting but it's intensely rewarding to perform in this way. THANK YOU to Ben for taking the time to answer these questions! If you don’t have your tickets for SUSANNAH (2/24 at 7:30pm and 2/26 at 3pm), we do still have some available. Click here to find out more about Ben and the rest of the cast, and click here to buy tickets which start at just $27.50. Colleen Daly returns to Baltimore Concert Opera to sing the title role in ‘Susannah’ this month. Colleen made her BCO debut as Micaela in ‘Carmen’ in 2013, and returned last year as Fidelia in ‘Edgar.’ She was kind enough to share some thoughts about her career and journey as an opera singer, and in particular, singing the title role in ‘Susannah’ with us. A: I had always wanted to perform, some how, some way. I started taking voice lessons in high school -- you know, to prepare for my career on Broadway -- and my voice teacher at the time noticed I had a more classically-oriented voice and an ear for languages. She introduced me to opera through a Puccini aria at age 17, and I became intrigued. I decided that this was the way in which I was going to perform, and started researching universities that offered a degree in classical vocal performance. At college (DePaul University), I was lucky to have some excellent instructors, including a voice teacher, Susanne Mentzer, who had had a major career all over the world and had coincidentally grown up in my hometown (Frederick, MD). She taught me not just vocal technique, but how it was possible to have a career in this industry and what that entailed. I had an extraordinary acting director that really showed me how vital human communication was, and how to do that effectively through this art form, and I had music history and theory teachers that opened my mind and heart to the world of classical music and all this powerful art form had to offer. I was hooked. The idea of being able to communicate with people through live musical theater, collaborating with other artists, and to be able to travel and experience new places, people, and projects was intoxicating! Q: Tell us about singing the role of Susannah in particular. I know you're very invested in this character, and would love for you describe what makes you so interested in her. A: It's equal parts exciting and terrifying. It's exciting because it feels like the first day of school. Everything is momentous, from purchasing the score and writing your name in it and highlighting your part, to learning all the pitches and rhythms, and understanding the style, the language of the composer, figuring out the interior life of the character. But it's terrifying because there's no prior knowledge to fall back on. And this is (hopefully) the foundation that you're laying for future performances of this character, and you don't want to do it "incorrectly". This piece is particularly challenging because of his writing style. So much of what Susannah sings feels like chatter, or even recitative, and to try to make this sound effortless and natural actually takes a great deal of effort. Understanding this shifting musical landscape, and when it goes someplace unexpected -- how do you get there? How do you make it sound connected to the drama of the scene instead of just notes on the page? And dramatically, how do you keep her an empathetic character, someone who is strong despite being a victim of her circumstances? Especially in this precarious political climate, I find it extraordinarily important that a female heroine who is a product of her environment and circumstances -- poverty, sexual abuse, and religious persecution -- has a voice that is valid and heard with compassion and understanding. A: I love concert opera. It allows you to focus so much more on the music, to let the drama come through in the expressivity of the singing, with everything else stripped away. I think it's an ideal format for coming to a role for the first time, and particularly the intimate setting offered by BCO provides the performer and the audience with an extraordinary experience of being a part of the same musical journey in a uniquely personal way, something that doesn't always happen in a larger house. It feels sacred somehow. I want to extend a big THANK YOU to Colleen for taking the time to answer these questions! She is a brilliant artist and a wonderful colleague. If you don’t have your tickets for SUSANNAH (2/24 and 2/26), we do still have some available. Click here to find out more about Colleen and the rest of the cast, and click here to buy tickets which start at just $27.50. 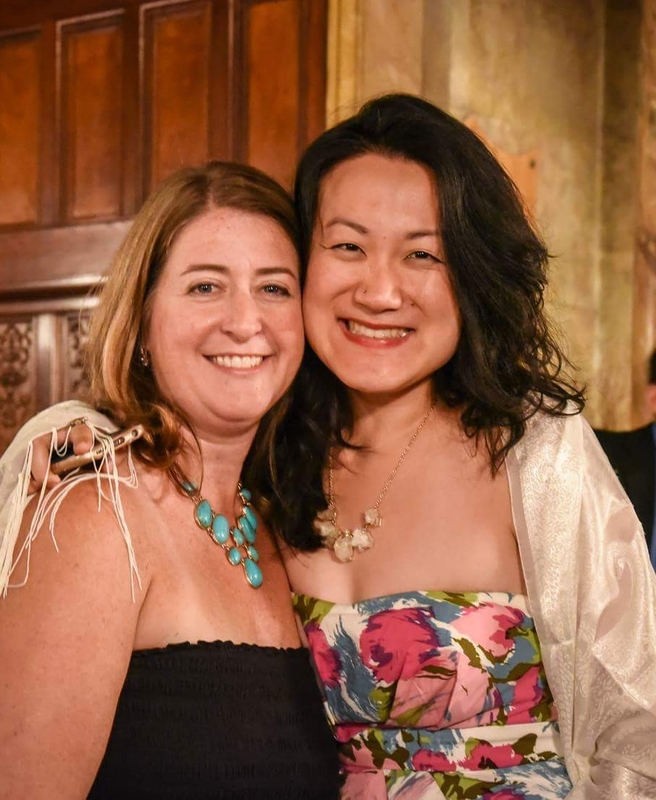 Jenny Wen, Hopkins med student, shares: "BCO is my favorite thing in Baltimore"
Executive Director Julia Cooke (L) and Jenny Wen (R) Photo: Elisabet Pujadas. "Hey I know this one!" Henry turned to me with a grin as the first lyrical phrases of "La donna e mobile" rang out on stage. Henry, a college friend visiting from Boston, and I were at the premier of Baltimore Concert Opera's Thirsty Thursday "Arias, Ambers, and IPAs" in fall of 2015. We lounged on the velvety red couches in the dazzling Engineers Club, nursing glasses of local Baltimore Brewery's Bell's Amber Ale (specially paired with the musical selections), while hanging onto each inhumanly beautiful note resonating from the performers. Surrounded by audience members who also couldn't help beaming, we drank in the beauty with all our senses. Both of us had grown up begrudgingly playing classical music (piano for me, clarinet for him) and had dutifully studied our scales and inversions. But as adults, we were still trying to learn what parts of our musical upbringing we actually feel connection with. I was lucky to have been exposed to opera in college as a happy accident; Henry had never been to an opera performance of any kind. At that moment though, both us had were equally enchanted. We had no doubts we were having the time of our lives. But arguably, the performers and directors themselves were having even more fun. They beamed jovially with each note, each wink at the audience, and each cheeky introduction ("this is the 'no you hang up' duet"). To our pleasant surprise, during intermissions and after the final standing ovation, the singers along with the executive director Julia Cooke and artistic director Brendan Cooke mingled with the crowd, and we discovered they're just as warm, funny, and charismatic offstage. In true BCO fashion, they invited the audience to join them for drinks and food nearby, which my friend and I eagerly joined. The BCO team brought me back to my college days of wonder and openness, that feeling of the world is your oyster and any new person you meet can change your life. During one of these post-show chow sessions after another performance, I sat next to Julia and Brendan and learned firsthand of their adventurous origin story and vision to share the best of opera with as broad an audience as possible. "Well to be honest, I really don't know much about music," I confessed between mouthfuls of jalapeno poppers, " I have a ton of fun, and I bet these singers are great, not that most of us can tell though." Brendan turns to me, suddenly uncharacteristically serious. " Well, I don't think that's true. People can tell quality. It's like when someone eats a hamburger from a McDonald’s versus a prime cut of filet mignon. They can tell the quality on the first bite, even if they don't know anything about steak, or have the language to describe it, or the skills to make it. It's the same with music. We only bring in artists at the top of the game and give our audiences the best." If I loved BCO before, that moment cemented my respect and understanding of this team. Contrary to what many may assume about opera, these folks don't take themselves seriously, but they are very serious about their art. That faith in the audience, that firm belief we all deserve the best regardless of our musical background, that opera is fun and joyful-- this spirit is what draws me to BCO. Brendan is right. I can always count on them. It is because I trust their vision and taste that I recommend Baltimore Concert Opera to everyone with full confidence, whether they are classical musicians or just curious, whether they grew up in small towns or are visitors from New York or London (Henry still asks about when shows are so he can time his visits). Since that first Thirsty Thursday, I've made an effort to come to each event I'm in town for with friends, dates, classmates in tow. Inspired by BCO's democratic, down-to-earth approach, I make a special effort to bring people who are new to opera. I tell them with absolute sincerity that the BCO is my favorite thing in Baltimore. At BCO, I don't hold back my tears, laughter, or cheers. I relish the opportunity to break out of my daily routine and enter a magical space saturated with beauty. I itch for each chance to revel in awe, rub elbows with every generation, and hear joyous exclamations and amazed whispers in multiple languages. I look forward to meeting new artists from around the country who humble and exhilarate me with their talent, passion, and pursuits of excellence in paths so unfamiliar to me. I am so grateful to BCO because they remind me how rich, expansive, and beautiful the world is, and how lucky I am to be here. I already can't wait for the next time. Join Jenny in her love of BCO -- make your tax-deductible donation today! Mezzo-soprano Heather Johnson returns to Baltimore Concert Opera to sing the title role in ‘Tancredi’ in co-production with Opera Southwest. Heather made her BCO debut as Rosina in ‘Il barbiere di Siviglia’ in 2011, and was our leading lady in ‘Carmen’ in 2013. She’s been singing all over the country since we last saw her, including her Metropolitan Opera debut! Heather was kind enough to share some thoughts about her career, and in particular, singing the title role in ‘Tancredi’ with us and with Opera Southwest. A: I was also involved in Music from the time I came out of the womb. My parents are both professional musicians and teachers and my grandfather was a tenor and choral conductor so I guess it was in my blood. I started out playing the violin when I was 4, added the piano when I was 6, then the oboe when I was 11 (that only lasted two years...I was horrible!) then finally started taking voice lessons when I was 15. I knew almost instantly that singing was what I wanted to do with my life. It was solidified when I went to college at St. Olaf and started to really study opera. I was hooked! Q: You told me in a recent phone conversation that you felt like Rossini wrote the role of Tancredi just for you! Tell us about singing it. A: It's amazing! I love this role so much. First of all, I typically sing the comedic Rossini roles so it's a pleasure to dig in dramatically to a role like this within the same musical style. Not only do I love the drama of the opera but I love that it's a bit lower than a lot of the Rossini roles that I sing. I had a baby two and a half years ago and, like many women who have children, my voice changed a bit. It really filled out in the lower middle so I love singing down there, if you will. A: Singing a role for the first time is always a bit nerve-racking. You can't really get a good sense of pacing until you actually get it "up on its feet", so to speak, with the whole cast. But, I love learning now roles! You get to sink your teeth into something new musically and dramatically that you can make your own. This role is particularly that way. Like, I said earlier, I love the drama of it. But, that being said it is a challenge as far as pacing is concerned. It's very large role and one has to really pace it so that you save enough dramatically and vocally for the scenes at the end. Q: Can you tell a bit about the BCO format and how the co-production element with Opera Southwest will be helpful to you and the rest of the cast? Johnson in Sarasota Opera's Cenerentola. A: Doing a co-production is such an incredible luxury! We get an entire week to work it musically which almost never happens in the opera world these days. It brings us back to focus on what is the most important part of opera....the music! Not only do we get to work out the musical kinks first here in Baltimore but then we get an opportunity to perform it twice just concentrating on the the music. This puts us all at such an advantage going into the staging process. Plus, it's always such a treat to sing here in Baltimore. I want to extend a big THANK YOU to Heather for taking the time to speak with me! She is a brilliant artist and a wonderful colleague. If you don’t have your tickets for ‘Tancredi’ this weekend, we do still have some available. Click here to find out more about Heather and the rest of the cast, and click here to buy tickets which start at just $27.50. I am an opera performer/director, a lover of music-theatre and drama-driven spectacle. I am also a fervent supporter of the concert opera form. My last two years with Baltimore Concert Opera have helped me understand concert opera's unique value in the general operatic landscape. As I become more involved with opera companies internally, I realize what streamlined concert opera can do to support our art form and boost audience development. Besides the obvious appeal of hearing fantastic singers perform gorgeous music in our own neighborhood, the concert format has an important place in the operatic scene at large. 1.) BCO can produce roughly four operas in concert form for less than the cost of one grand opera. 2.) Because of this cost structure, concert opera can afford to take chances on rarely-heard works and rising young singers. 3.) Concert opera can give full productions a head start on cast cohesion through collaborative co-productions. 4.) Most importantly, Baltimore Concert Opera gives Baltimore more opera. More singing. More operatic options. More chances to connect with audiences. This is a very, very good thing. So often, our art is overlooked, misunderstood, or just unknown. Baltimore Concert Opera has reached hundreds of new patrons this past year through 4 mainstage productions and 3 "Thirsty Thursday at the Opera" events. Some of these new patrons will prefer Falstaff over Lakme, or Amleto over Die Fledermaus, but the point is - folks can have choices, develop opinions, and learn about opera in Baltimore. This is a valuable chance for Baltimore's lucky opera lovers, singers, and producers. I am all three -- but if you identify even as one of these, you can be proud to join me in my support of BCO. Courtney Kalbacker is a dedicated opera performer and producer based in Baltimore, MD. She has taken on many roles both on and off stage including currently serving as Managing Director of Baltimore Concert Opera and Director of Production at UrbanArias. She is also a freelance stage director with Maryland Live Arts, Victorian Lyric Opera, UrbanArias, Silver Finch Arts Collective, Unmanned Stagecraft, Oklahoma City University and the Boston University Tanglewood Institute. She performs as a coloratura soprano with many local companies including Washington National Opera, Lyric Opera Baltimore, The Victorian Lyric Opera Company, Harford Choral Society, HUB Opera Ensemble, Silver Finch Arts Collective and at venues abroad including the Warsaw Chamber Opera and Kingshead Theatre (London). More info at www.CourtneyKalbacker.com. As a sometime backstage worker, I am often distracted, watching a performance, by an unfortunate wig, a costume problem, an annoying mannerism or odd direction. I love the theatre of a production, and sometimes pay more attention to that than to the music. With Baltimore Concert Opera, and the friendliness of the audience and the Engineers' Club ballroom, I can focus on the singing. I am struck by the joy -- and the commitment -- of the singers doing what they love and have chosen to do with their lives -- sing. And how well they do it! BCO is pure pleasure. Stories are what draw me to Baltimore Concert Opera; the stories of the organization, the stories of the operas we present, and the stories that lead each of us and our audience to the music. BCO was founded on the idea of keeping opera alive in Baltimore, and from that idea we have attracted incredible vocal talent to the city and fostered the incredible voices of our home. It's a tale of incredible resilience, determination, and passion. We've told some of the greatest musical stories put to paper, from uncovering a lost Amleto to the epic tale of Aida. I have always enjoyed opera, and even studied it extensively in college, but what draws me in the most is the power of the human voice to convey the deepest of emotions. Each member of our audience has their own unique story, joining us from within Baltimore or coming into the city to see us. I'm excited to help the Baltimore Concert Opera continue its story and write the pages of its future. Susan Yager is focused on melding her passion for music and accounting by serving the BCO. She is an accounting specialist at MJM Innovations, a software and management services firm. In her position she works with various government agencies to improve transportation services for seniors and persons with disabilities through auditing and payment processing. To further her career, she is pursuing a graduate certificate in accounting at the University of Baltimore. Susan’s bachelor’s degree is in vocal performance from Trinity University in San Antonio, TX where she won the Rosalind Phillips Vocal Excellence Award. 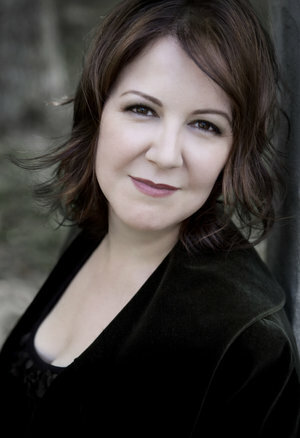 While in Texas Susan sang with the San Antonio Chamber Choir and the San Antonio Opera. In Baltimore Susan enjoys singing with the newly formed chamber ensemble, Canticum Novum. Moving to Baltimore five years ago from the Washington, DC area, I had thought I knew what opera was. I was blessed in that my parents introduced me and my brothers to opera when we were boys. Little did I realize at the time that I was weaned on Renata Tebaldi LPs - it was just something in the background as we had our traditional Sunday pasta dinner. As a young adult, I was active with the young professionals group, BRAVO!, that supported the Washington Opera (now Washington National Opera) and saw my share of wonderfully staged productions as well as the headliners that sang them. But in Baltimore, I was introduced, through former board member Mimi Hatch, to a more endearing, intimate and just-as-musically potent form called "concert opera." The opulence of the Garrett-Jacobs Mansion, the friendliness of the Cookes (Brendan remembered my name the second time I came), and of course, Maestro Harp and the singers sealed the deal. I knew I had to become more involved. I now better understand and appreciate the behind-the-scenes work it takes a small arts organization to achieve excellence, the wonderful personalities and talent of the singers who have stunned us with their gift on the stage, and the camaraderie it takes to make it all happen. Most importantly, as I stand and either welcome guests or thank them for coming on their way out, I feel great satisfaction knowing we are touching so many people in this great city. A lifelong opera lover, Joseph Zuccaro has over 25 years of experience in Marketing, Sales, and Business Development, including angel-funded, pre-IPO and post-IPO technology companies. He is the Founder and President of Allinio LLC, a CRM and Marketing Automation professional services firm helping organizations plan and implement web-based technologies to better gather, store, analyze, share, and act upon data that maximizes marketing ROI and drives higher revenue. Joe attended the United States Coast Guard Academy in New London, Connecticut. He earned a Bachelors degree in Logistics, Transportation, & Supply Chain Management and an MBA in Marketing from the R.H. Smith School of Business at the University of Maryland at College Park. I love music. I grew up playing classical piano, but my tastes run eclectic. The great thing about living in Baltimore was the ability to see a band play at Hammerjacks or The 8x10 on one night, then listen to the Baltimore Symphony Orchestra or the old Baltimore Opera Company on the next. In fact, it was through friends at the old Baltimore Opera Company that I first heard about Brendan Cooke's idea for Baltimore Concert Opera in 2009. From that initial contact, I started as a volunteer with BCO's first production, Don Giovanni. After a few more productions and a few conversations with Brendan, I was introduced to the board and ultimately joined. Of course I joined! I was tremendously excited to have the opportunity to expand the opera offerings in the city. Baltimore Concert Opera allows existing opera fans hear the music in a new way, while also providing the opportunity for a new audience to become introduced to the power of the voice. It's so rewarding to see new audience members from MICA or Johns Hopkins listening to opera alongside life­long opera lovers. I'm happy to play a part in sharing this timeless music from generation to generation. Dennis Ferguson has been involved with Baltimore Concert Opera since its inception in 2009, first as a passionate volunteer and later as a board member and chairman of the Technology Committee. As a result of his dedication and devotion to BCO, he was appointed as president of the Board in January, 2013. From a young age, he began developing an interest in classical piano and computer software design. He further developed his technology and management skills at Carnegie Mellon University and University of Maryland. Since college, he has worked for St. Paul Companies and Travelers Insurance. Today, he is employed as a lead IT specialist and project manager at the Social Security Administration. In addition, he also serves as the president of his homeowner’s association and volunteers at his church and other organizations in the Baltimore community. In his remaining time, he enjoys traveling the world with his wife of 9 years. The Magic of BCO? Hear 19th c. operas in your own ‘Downton Abbey’! Knowing many of the singers and pianists of the young Baltimore Concert Opera since the beginning, I wanted to support the company from their first year, 2009. Single tickets led me to become a subscriber and I was thrilled when a friend asked to come along - and then she became a long-term subscriber. We now enjoy four operas per BCO season. When I first started attending opera in NYC in the late 1960s, I always wondered what the on-stage, piano rehearsal sounded like, especially for complex orchestral works. Who knew that many years later I would have this intimate experience! At the BCO, the absence of 80+ instrumentalists is never an issue. The piano vocal scores are extremely rich in their own way and one can focus on the beauty of the voices with all of their colors and vocal shadings. The young, talented soloists travel from all over to perform here in Baltimore and this makes for a great opportunity to hear emerging talent in a gorgeous, nineteenth-century environment (think Downton Abbey) and at reasonable prices. Patrons have the chance to hear little-known operas, such as Amleto, Edgar, and Tancredi. Join us on a Friday evening and if you love it, return on Sunday for the second performance while the music and singing are still fresh in your mind. As a new board member, I would love to share my enthusiasm and admiration for BCO with you. We can all be part of the magic of our Baltimore Concert Opera! After seeing his first opera in high school (Carmen in English by the Met Opera National Company at Lincoln Center; I still have the program! ), John, overnight, became an opera fanatic. Later that same year he saw La Fanciulla del West at the old Met right before it closed. He recalls straining to see the tenor’s blood fall from the hayloft in the second act from his high-in-the-sky Family Circle seat, next to a column. No such luck! After that he went to the opera as much as possible. Changing careers mid-life from telecommunications sales to museum work, John was the Docent Manager at the Snite Museum of Art, Notre Dame, IN and moved to Baltimore in 1992 to take the position of Manager of Docent and Intern Programs at the Walters Art Museum, where he currently works. John was instrumental in organizing our four Silent Auctions and he participated in our Free Fall Baltimore Aïda presentation in 2015. He has been a long-term BCO subscriber and looks forward to seeing the company expand and enliven the city arts’ scene.